Near the end of November I was cycling pass the Bay Bridge when I noticed a new sculpture. I was early to my client appointment so I stopped to inspect it and took a few pictures. 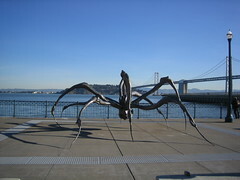 The sculpture was a giant spider parked out on the sidewalk, big enough to walk under if you stooped. I thought it might be the work of a local artist. I posted my picture to flickr and called it Mutant From The Muck as a reference to the size of the spider and our recent oil spill. In a day or two one of my flickr contacts left me ten links to other photos of similar spiders in major cities all over Europe and North America. "It seems to be multiplying", he quipped. There it was outside the Tate in London, the Guggenheim in Spain, in a city square in Denmark, Canada and Japan. Clearly this was a must have spider. From the tags on these other photos I learned that the name of the spider was "Maman" and the artist was a French woman from a family of weavers. To be connected to so many points on the globe like this, through an original work of art, was just too cool. I felt worldly and cosmopolitan. This was the appeal of flickr; you never knew what surprising connections might pop up and you had friends to help you find those connections. When my computer died last month and while I was waiting for another to be delivered, I went from house to house begging for an online connection from any friend I visited. Though I had a back-up computer with which I could do my writing and pick up e-mail with dial-up, it was no longer enough. I felt a huge emotional void where my internet connection had been. I was cut off, isolated as though in a remote village. What had changed? I couldn't seem to run my life properly. I was in the middle of several auctions on ebay that needed tending. I couldn't cue up the delivery of my next movie from netflix or check my library for a book I'd heard about. I couldn't see if I still had credit on my phone card or if anyone was reading articles on my blog. But what really made me feel intense withdrawal symptoms was that I couldn't post to flickr and leave comments on other people's pictures and blogs. That's when I realized I was a committed content provider, one of the legions posting work freely online for anyone to look at or use, leaving comments that might make someone's day, explain something important to interested parties or best of all, make someone laugh. This activity had become vital to my own well being. I was at a loss to explain, to those who weren't also conducting these semi-secret relationships, why this was so compelling. Why was it so valuable to have a stranger interested in one's pictures? Someone who cared about what I was doing, but whom I likely would never meet. In fact if I did meet them I feared I would loose interest. The mystery lay in being able to follow an ongoing narrative that I myself could participate in and influence. My contacts shared common interests with me that weren't covered broadly or at all in mainstream publications—solar ovens, non-electric hand tools, urban cycling, organic gardening, waxed cotton gear, sustainable living. Sometimes I picked a contact who lived somewhere I was interested in keeping tabs on—city life in Bangkok, a suburb in England, urban cycling towns in Europe, a corner of Brazil, New York City, rural south east Asia. 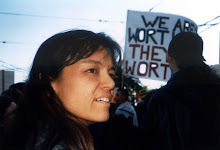 These personal photos gave me a window into the world that I could trust to be devoid of hype or agenda other than the one openly promoted by the individual. Most of my contacts were younger than me, most were men. Most had made me their contacts first for reasons of shared interests or just because they thought I was interesting. It was a mutual admiration society. On a recent Saturday on the first sunny day after endless rain, I spent five hours inside a padded warehouse learning how to swish a rubber stick around. It was thrilling. Thrilling to learn something new; thrilling to watch movement so familiar it was as if the sword was already in our minds. How was that so? Was it from watching all those kung fu movies or a memory of archetype? Or perhaps it was a hunger to move in physical space in a way that expressed immense purpose and decision within the realm of human scale? I never felt this way about a tennis racket or a golf club, but maybe some do. I steadied my mind to absorb the choreography of the form. So prone was I to narrate myself right out of the room, traveling far away on a story I was telling myself. To stay focused I narrated myself into the form. Now we bow, now we turn to the rear, step around and swing the sword at our opponent. 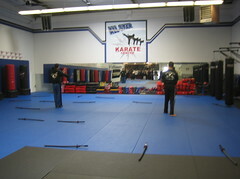 The newness of each move entered my mind like a gift and kept me riveted to the moment. It occurred to me that this opportunity to absorb something new and complex is a sacred space. Zen Buddhists call it beginner's mind. Early in my identity as a writer, I read an interview with Kurt Vongegut who said he didn't understand why everyone was so interested in eastern meditation when we had a form of meditation right here in the West. It is what writers do. My most influential writing teacher led me, and a small handful of others, down this path of the writing mind. Through her writing exercises, I learned to recognize natural metaphors arising—those thoughts prompted by what I had been observing or doing, the interweaving of physical action and narrative. She then pointed out that once we were able to access this narrative we could stay in the present in an observant manner by practicing this kind of writing in our heads. It is this ability to be observant as though on the verge of discovery and transformation that makes blogs compelling for me to read. As a content provider for just this sort of ever evolving narrative, I felt compelled to show up. My narrated life depended on it. Without it I was sitting at my desk alone, staring into the abyss searching for meaning. This is the downside of being self-employed. At a day long retreat of veteran organizers last year, someone asked how many present were on antidepressants. Of the eighteen or so in the room only two did not raise their hands. I was one of the two. On days when I find myself faced with the abyss, I understand why the number is so high. First there is the matter of creating one's own stream of income. If I have clients booked, all is well until I am too busy trying to do too much for too many and am stretched to the limit. When the calendar is empty I am sitting in a room with a limited air supply waiting to slowly asphyxiate. Panic sets in along with mental paralysis. I know I need to get out, network, generate contacts that will bring in work. This is a performance in itself, part faith, part pumped up bravado to show that I am indeed valued on the market when I feel most like a fraud. It is a bipolar sort of existence. As a content provider I have much more control over my life. I create myself. I have value just being in the world. 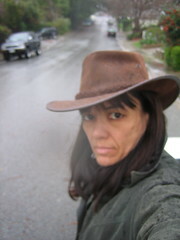 I post a picture of myself standing in the rain wearing my Australian cowboy hat and waxed cotton raincoat. I comment on the weather and the climate destabilization that has brought us these hurricane force winds. The usual 8 people read my comments. I post a picture of the contents in my bag and add it to the thousands of others on the "what's in my bag “ group. 456 people visit my bag and read the notes about why I carry a letter opener. A man writing an entry for Wickipedia writes to ask if he can use my pictures of Tassajara in his piece about the Zen monastery. An online guide asks if they can use my picture of the Minnesota library. A flickr contact asks if he can use a picture of a friend's garden for a screensaver. The art director of Yes Magazine writes to ask if she can use my picture of the president of my electric vehicle club who has just written an article for them about plug-in cars. "You have a fun photostream", she comments. When my internet connection was restored via a new computer, I realized that it is loneliness that has driven me to this online life. (And I am one of the lucky ones who has a partner who shares my passions.) This is a useful insight because now I can understand the emotions that are informing my decision making process. Should I enroll in another class? Or is it that I just want to see the same faces when I walk into a room, working on the same shared topic every week? That is it exactly. As a content provider, I have exhausted that topic. I realize I must leave it now and find a new one. One of my most popular essays posted to my blog describes my experience building a cob house (from mud and straw) or as I described it to my mother—"It's like the nice white cottage with the thatched roof that Milly Molly Mandy lived in". (Milly Molly Mandy being the heroine of a popular English children's book we both read in our formative years.) Cob building is a traditional building method of pre-industrialized England. Thomas Hardy lived in such a house. The pictures that go with my cob building article have been summoned in multiple searches. So too has the picture of my parents as an interracial couple. The words "mixed race" entered into a search engine is still bringing readers to my blog. Neither of these topics seem to be getting enough coverage. I'd been thinking of taking a trip back to my childhood home to join a study group scheduled to visit sustainable, eco-driven living solutions including cob buildings, organic farms, a permaculture settlement, a seed saving collective, an intentional community and a fair trade cooperative. I just couldn't bring myself to fling myself across the world to then take an 8 hour bus ride by myself to the hinterlands of rural Thailand. But as a content provider I shrugged off such barriers. I would have purpose. This changed everything. What better than to report on the sustainable efforts of rural farmers in the developing world? Surely this story would be compelling in that a narrator with a personal connection to that part of the world would venture to bring back solutions vital to the healing of the planet. Plus I would get to sleep by the side of a rice field under a mosquito net, take local transportation, shower with a bucket and use composting toilets. This was my idea of travel heaven. I wrote my family in Thailand. I wrote the leaders of the study trip. I wrote my publisher. I wrote the art director of Yes magazine asking if they'd be interested in articles. I made phone calls. By the end of the week I had registered for the trip and bought my plane ticket. It was exactly a month before I would depart. Suddenly everything was taking shape. I could see into the future. The sword in my mind made decisive moves slicing here cutting there. This is what needs doing now. This is my path. Nothing will stand in my way. All will bow before my sword. It certainly beats staring into the abyss. Thank-you malva. And that is a totally cool webcam Maman. My first webcam experience. If you ever want to do something local, such as touring a certain EV company, let me know. Also in a few weeks, I will be having (and probably hosting) a seed swap and potting party. Mostly vegetables but a few flowers, too. I live in Emerald Hills.